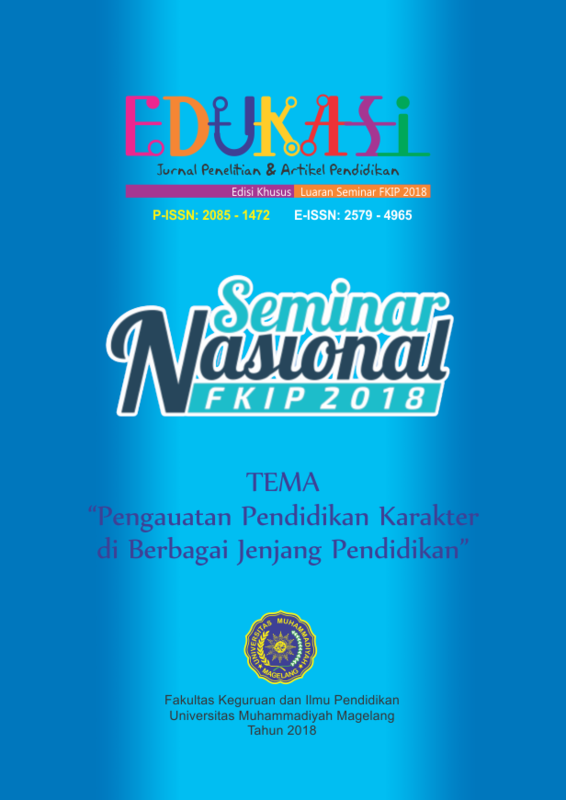 The objective of this research is to describe the efforts in strengthening character education carried out through the implementation of child friendly education at SD Potrobangsan 1 Kota Magelang, including its obstacles and problem solving. This research is descriptive qualitative in nature. The subjects are the principle, teachers, parents, and students. The data collecting techniques are observation, interview, and documentation. The researcher implemented the interactive model of Miles and Huberman as the data analysis technique which consists of data collection, data reduction, data display, and conclusion drawing. In validating the data, the researcher used resource and technical triangulation. The research result shows that (1) the strengthening of character education at SD Potrobangsan 1 Magelang is implemented through teacher modeling, more teacher attention to students, and habituation carried out by teachers continuously; (2) during the teaching learning process teachers are always friendly to students, always giving good advice, and preventing bad punishment in the forms of violence, and (3) forming school children friendly task force and providing its supporting facilities, i.e. child friendly library, children health centre (UKS), school canteen, water sanitation to wash students hands, wall of motivation, clean toilets, drumband extracurricular, boys scouting, wall magazine, and national days celebration. The obstacles faced by the school in implementing the program are the varied parenting patterns of the parents, the low economic condition of the parents, the lack of attention from the parents to the children, the social environment which is not condusive, and the fast development of technology. To solve the problems, the school carries out home visits and intensive communication with parents, orally and in written froms. Arismantoro. (2008). Character Building: Bagaimana Mendidik Anak Berkarakter. Yogyakarta: Tiara Wacana. Mustaqim. (2017). Sekolah Islami Penuh Kasih Sayang. Mutualista, 11 (9), 3-4. Senowarsito. dkk. (2012). Implementasi Pendidikan Ramah Anak dalam Konteks Membangun Karakter Siswa SD Negeri di Kota Semarang. Diakses tanggal 13 Agustus 2018 dari http://journal.upgris.ac.id/index.php/media penelitian pendidikan. Wulandari. (2017). Sekolah Ramah Anak. Mutualista, 11 (9), 5-6.